Eliot Higgins, founder of investigative outlet Bellingcat, told CNN that Bellingcat sent an “insider,” one of its partners in Russia, to Alexander Mishkin’s hometown of Loyga to speak to locals and further investigate Mishkin. Multiple sources told Bellingcat they saw on Mishkin’s grandmother’s mantle a photo of Putin bestowing the Hero of the Russian Federation award, given for service and valor, upon Mishkin. 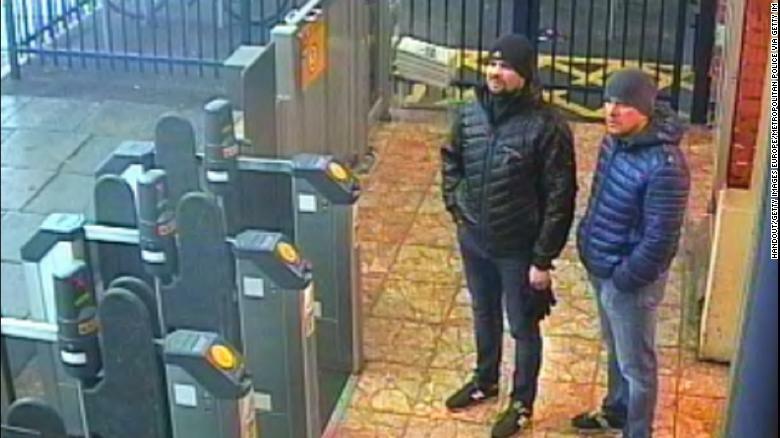 The suspects, seen here in Salisbury, were initially identified as Alexander Petrov and Ruslan Boshirov. According to Bellingcat’s reporting, which CNN has not been able to independently confirm, Mishkin, 39, is a doctor who works for the GRU, Russia’s military intelligence agency. Bellingcat alleges Mishkin traveled under the name Alexander Petrov when he and GRU Col. Anatoliy Chepiga traveled to the southern English city of Salisbury in March, where the agents allegedly poisoned the Skripals with the nerve agent, novichok. Sources in St. Petersburg also identified Petrov as Mishkin, Bellingcat reported. “Once we had his name we were able to get his identity documents,” Higgins said. “We had a photograph that was obviously the same person. He’s got the same blemishes on his skin. The ear shape matches. His face is exactly the same. The suspects themselves have told Russian state television they traveled to Salisbury as tourists. The Russian Embassy in London said it was willing to discuss “speculations” about the Skripal case with British authorities but cast doubt on the Bellingcat report. “The Russian side will be ready to discuss both this information and other outstanding issues with the British authorities through official channels if we receive a respective request from London,” the Embassy said on its website. The Kremlin has not commented on the matter. The UK’s Metropolitan Police Service said it would not comment on speculation regarding the true identities of the two men. In a statement, the Met reiterated it believes the two suspects used aliases. “A European Arrest Warrant and Interpol Red Notices remain in circulation for the two men,” the police service said. Trained as a naval doctor? Mishkin was born in 1979 in Loyga, Bellingcat said, and graduated from an elite military medical academy, where he was trained as a naval doctor. While his current military rank is unknown, he was either a colonel or lieutenant colonel at the time of the Skripals’ poisoning, Bellingcat reported. Bellingcat last month identified the other suspect as Chepiga, aka Ruslan Boshirov. Russian Foreign Ministry spokeswoman Maria Zakharova called the first report “bogus.” CNN has contacted her and Putin spokesman Dmitry Peskov for comment. The alleged poisonings caused fallout between Moscow and London, with many UK allies weighing in against the Kremlin. At an energy forum in Moscow last week, Putin dismissed the furor, calling Skripal a “traitor” and “scumbag.” He said the Salisbury affair was being artificially “blown up” by the media and will soon pass.